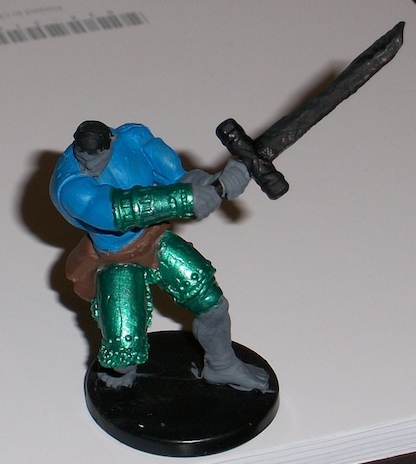 My favorite D&D character in college was a half-orc barbarian named Horknuth, who went by the stage name “Hork the Orc.” He was a gladiator-slave with an extremely low Intelligence and a penchant for fine shirts. Unfortunately I left the mini in Iowa when I moved to Kansas all those years ago and for one reason or another Hork hasn’t seen play since. Recently my D&D group has started a second campaign in which the role of DM is shared between all the players. The PCs are employees at a detective agency which performs tasks structured to be resolvable over the course of a single evening. This way we can keep a semi-cohesive story but allow individual players to come in and out without complex-ish explanations (“Carl can’t play? Oh, um, I guess Dinkles the elf twisted his ankle. He’ll catch up.”). This campaign seemed like the perfect opportunity to begin playing Hork again on a regular basis. I was having some trouble finding a mini figure so I decided to do some surgery. 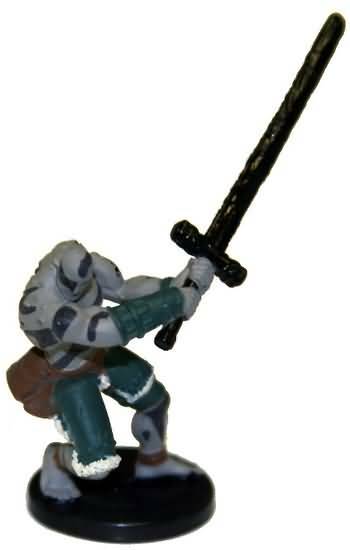 Subscribe to comments with RSS or TrackBack to 'The re-rise of Hork the Orc'.